It is always easy to take for granted where we live but I do find that winters out here really bring it home to me what a beautiful and blessed region of France we call home. Winters in the foothills tend to be predominantly sunny with lots of crisp, blue sky days and often warm enough for lunch outside, even in deep mid-winter. Because we are lucky enough to have views of snow-capped mountains at every turn, I know many people assume that this is a cold or even snow-bound part of France but this couldn’t be further from the truth. It is rare for us here in the foothills of the Pyrénées to have more than a smattering of snow each year and usually less than the UK. The mountains provide a protective barrier and we are about as far south as you can go in France before hitting Spain so, when the sun shines, it still has plenty of warmth even in winter. Even better, however, we have the choice of either enjoying the view of snowy peaks from our sunny terrace or jumping in the car and, an hour later, be enjoying some first rate skiing in one of the many lovely and still relatively undiscovered and uncrowded ski resorts of the Pyrénées for half the price of skiing in the Alps. At the end of the day, we often drive back home and finish with a cup of tea in the garden in the afternoon sunshine before night falls and it’s time to enjoy proper winter evenings in front of the fire. To my mind, we really do have the best of both worlds. 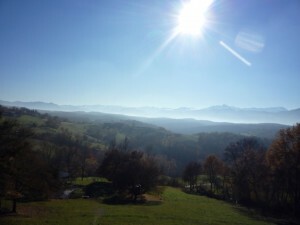 So just because there is a view of the mountains from many of the properties for sale here in the southern Midi-Pyrénées, don’t be fooled into thinking that it must be a cold, mountain climate or you will be missing out on one of the most beautiful, unspoiled and truly special regions of France. Happy New Year and may all your French property dreams come true in 2015.